Aw, such sweet little booties!!! My Christmas decorations came down on December 31 as they do every year. I never leave the old into the new year. Some tradition I learned growing up. Sounds good to me, so I work myself to death New Year’s eve getting it all down. I did tell my husband that next year we will be putting up the tree in November and taking it down the day after Christmas. We will see if it happens. That’s a great tradition. I see the logic behind it and I support it. That definitely gives you a little more time to enjoy all of your decorations. Yes all decorations are down. But the boxes aren’t quite back in the loft yet. I do have one Christmas decoration I don’t take down. It is a hanging fabric heart. One side has Christmas embellishments on it. The other is plain red silk. I just it to the plain side for the non-Christmas part of the year! Sounds like a great piece to have 🙂 So sweet. I know what you mean about the boxes. Mine are still empty and I’ll be using them next week to put everything away. Ugh, yes, I forced my family to help me undecorate on the 2nd because I was so tired of looking at it! Haha! I remember those days! I packed everything up early this year. It’s kind of sad to take everything down alone after the girls go back to school, so I did it before this time. But with little ones it changes everything. One year my mom left the tree up until Feb. because the weather was so awful, and there was already very little light up north. It was cheery to have those lights on!! I was really small maybe preschool, but I still remember it! I did minimal decorating this year. My husband had an accident and broke his hip on Dec. 15th. We wound up staying home for the holidays and keeping things quiet, so I just strung up some lights around the living room and got out the decorative hand towles. I haven’t put any of it away yet, although I’ll probably wash the towels and store them away for next year soon. The lights may stay up until spring. We need some color here! PS. 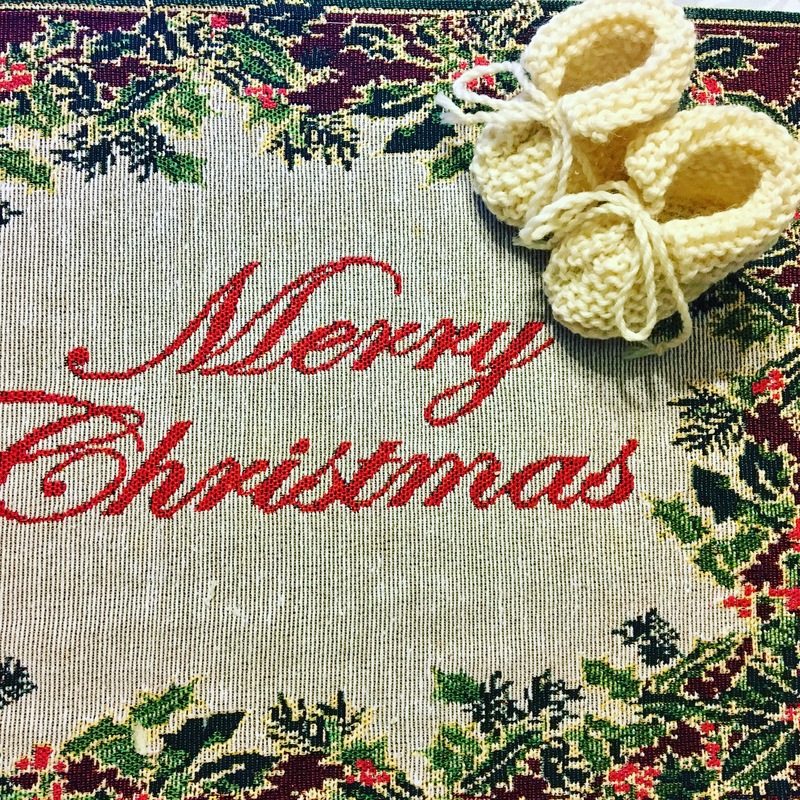 Love the placemats — and the booties! My decorations will come down tomorrow. I contemplated doing so on Monday this week, but wanted just a little longer with the spirit. But, I can tell I am done as I don’t even turn on the tree lights in the evening now. And really, I’ll be glad to reclaim that space in my living room. It may be a large room but putting a tree in there really feels like it’s sucking up the space. The booties are adorable, and so pretty on the place mats! Aw thank you. 😊 I know what you mean about space. We also have a large living room but it changes completely once the tree is gone. As ever my decorations stay up until 12th night – Christmas isn’t over until then. So right now I’m half way through taking them down and am having a tea break! Love the placemats and the booties. Love the booties and the placemats! My decorations are still up. I never take them down before 12th night. It’s time for them to come down, but it’s such a depressing activity for me–my husband usually does it to save me the grief! Oh, look at those booties! And the Christmas placemat does make a great background – did you leave them out after Twelfth Night, or have they been put away safely for next year? I’ve also been having a nosey around your new yarn store – it looks awesome! Good luck with it in 2017! I’m working on it 🙂 my preference for yarn is exactly like yours. Right now all yarn I have is natural Merino, Cashmere, silk with the occasional blend with a little high-quality nylon (Sugar Bush Glaze). And I’m knitting with the Sugar Bush Crisp right now. It’s gliding on my needles. It’s such a pleasure to knit with. Niiiice! It’s so true… Once you start working with good yarn, it’s impossible to go back! Had to un-decorate early as we left for 10 days of skiing in Colorado on January 6th. It’s a chore I do over a few days as I can’t bear seeing it all go away at once!